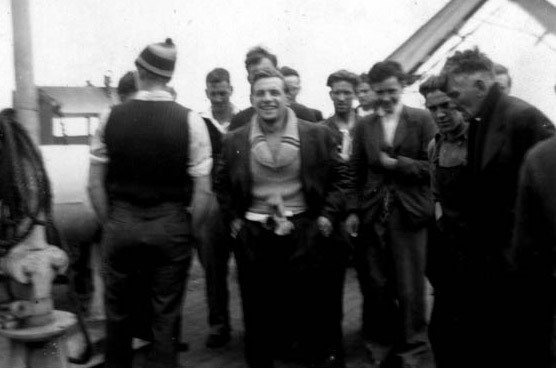 Smiling survivors of Fort Qu’Appelle, with much to be grateful for, aboard HMCS Melville on 20 May 1942 after they had been sunk with the loss of 13 crewmates on a maiden voyage. The British steamship Fort Qu’Appelle was built in the North Sands class by Burrard Drydock and Company of Vancouver, Canada for the MoWT, or Ministry of War Transport in London. Her owners were William Thompson and Company (known as the Ben Line) of Leith, who chartered the ship to the MoWT. Completed in 1942 and home-ported to London, she was 7,121 (or 7,127) gross tons, 441 feet long, 57 feet wide and 34.9 feet deep. Here triple cycle steam engines developed 505 net horsepower, driving the ship at 11 knots with a single propeller. On her final voyage the Fort Qu’Appelle was under the command of Captain Wilfred Alexander Murray, age 38, seconded by First Officer John Gair. The ship’s first and final – only – voyage was a long and eventful one. The routing was from Vancouver to Panama via Seattle and then to the UK via Halifax, However on the 6th of May they picked up an SOS message whilst in the Caribbean between Panama and Halifax. On arrival at the scene of distress they learned that another vessel had already retrieved the survivors. The following day they picked up 24 survivors of the merchant ship Green Island of the Ford Motor Company, and the Fort Qu’Appelle was instructed to discharge them in Kingston, Jamaica. Green Island had been sunk by the German submarine U-125 under Folkers the day before. For a few hours on the 9th of May the British ship discharged their survivors ashore in Jamaica, then resumed course for Halifax, zig zagging during the nighttime. The Fort Qu’Appelle’s cargo was a general one of between 7,000 and 9,200 tons, and included 1,000 tons of the chemical Acetone stowed in the Number 1 and Number 3 holds forward, below decks. This included 104 bags of parcels in the second hold, four bags of special mail, and a single bag of consular mail from Jamaica to the UK, stowed in the captain’s cabin. Fort Qu’Appelle was armed with a 4-inch gun, an Oerlikon machine gun, 4 PAC rockets with kites, and two .5 caliber Colt hand guns. There were 2 naval gunners to man the 4-inch and 45 merchant mariner officers and men manning the ship and its engines. 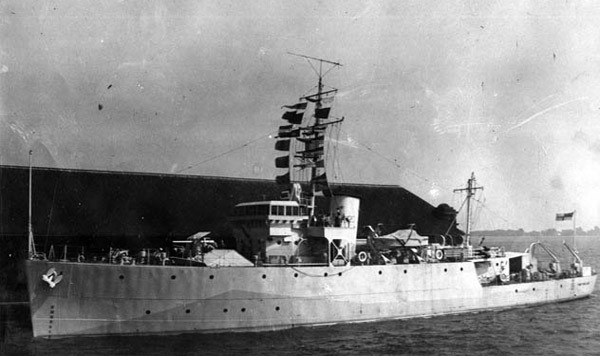 The ship was equipped with degaussing, or anti-mine and anti-torpedo electrical equipment strung around it, however it is not known if the equipment was switched on at the time of attack. After 10 pm on Saturday the 16th of May the Fort Qu’Appelle was heading North at 11 knots in position roughly 300 miles east-southeast of New York and 250 or so miles south of Cape Sable, Nova Scotia. The seas were moderate and the wind about 20 knots from the west. According to Chief Officer John Gair, “It was a very dark night, but the weather was fine and visibility good.” In the bridge Captain Murray, Gunner John McLaren, aged 35, and Third Officers James Stanley Chapman, age 21 were on watch. At 10:54 pm local time on the 16th of May a torpedo fired by the German submarine U-135 under Freidrich-Hermann Praetorius slammed into the aft end of the Number Two cargo hold forward on the starboard side, just forward of the bridge. Gair, who had been off watch and sleeping, recalled two distinct thuds followed by a muffled explosion. Immediately Captain Murry, Gair and the Chief Engineer inspected the Fort Qu’Appelle but did not detect damage to the deck. However as the ship began settling by the bow, Captain Murray ordered abandon ship for the 47 persons aboard. The time was now 11:10 pm. His instructions were for the boats to stay nearby and, if the condition of the ship was stable in the morning, to re-board and possibly salvage her. Captain Murray presciently sank the confidential codes and mail in weighted bags. The impact of the first torpedo shattered the two lifeboats on the starboard side, however the Number Four lifeboat was launched with 30 men, leaving 13 on board and Gair, the second officer and two cadets on board letting the boat free. Then at 11:15 pm the Number Two lifeboat was lowered on the port side just forward of the bridge. During this process a second explosion slammed into the ship in the vicinity of the lifeboat, with the effect of almost cutting the young ship in two and exploding the cargo up forward. The other boat, Number Four, was in the water, tied to the ship, and it was blown away from the ship by the blast, with several men thrown into the water due to the concussion. The men were able to get back to and re-board the boat. Nair and the three other men let go one of the rafts situated after, and as the Fort Qu’Appelle was sinking quickly by the head, they jumped into the water after the raft. They stayed on the raft and signaled with lights to the men in the lifeboat that they were to remain near the sinking of the ship until dawn. U-135 was never seen, and Praetorius never approached the survivors for information. Then around 15 minutes after midnight on Sunday the 17th of May a “violent explosion” presumably from the Acetone up forward “lit up the whole horizon.” At that time the forecastle head was at sea level. When the ship sank about 23 minutes later, at 37 minutes after midnight, the lights were still burning, meaning the generator was still functioning. By 7 am that morning Gair and his colleagues swam from his raft to the lifeboat, writing that “the water being quite warm, I thoroughly enjoyed the swim.” The only explanation for this is that the ship must have still been in the warm Gulf Stream current. Because of a Canadian portable wireless set on board the boat, they were in contact with Halifax continually. The set “worked splendidly,” although when it rained the signal faded out somewhat. Their emergency food supplied held up and since it rained all but a few hours, they had plenty of rain water as well. Indeed, compared with most other lifeboat ordeals, where the men crave water, the ocean if freezing, and no one is aware of their plight, there’s seems especially blessed. Indeed, airplanes were sent to their aid. On Tuesday the 19th the aircraft named Canso 9748 “in spite of very adverse weather conditions proceeded on patrol for the lifeboat and finally sighted it at dusk.” This brave pilot then worked on vectoring a surface vessel to the survivors, who saw one of the planes. Because of a 60-mile position error the plane was some distance off. Amazingly they were able to reach Halifax, ask them to instruct the plane to alter course towards the boat’s position, and this was relayed to the plane, which then came over and discovered them! The pilot then dropped food as well as four rockets, explaining that the plane would instruct them when to fire them. That evening a Canadian minesweeper, HMCS Melville (J 263) under Lieutenant Commander Ralph Thomas Ingram, Royal Canadian Naval Reserve, hove into sight. Without waiting instructions, Gair and his 33 companions fired two of the rockets. In the words of Gair, “they were wonderful, each one sent up twelve bright white flares, which the corvette saw 30 miles away.” As a double indemnity the airplane remained on scene, bathing the lifeboat in a halo of light from floating flares. The certainly were blessed. By 9 pm that day the Melville, guided to the survivors as a mother hen to her chicks, had picked up the 34 survivors, who had managed to sail roughly 100 miles closer to shore in roughly two days, averaging about two knots. The wind has been steady to the westward and they had sailed close-hauled all 48 hours. The Melville’s Lt. Cdr. Ingram and his officers and crew delivered the survivors of the Fort Qu’Appelle to Shelbourne, Nova Scotia the following day, Tuesday the 19th of May 1942 at roughly noon. Chief Officer Gair specifically commended his Second Mate Mitchell for being particularly helpful in the management of the sailing lifeboat, modestly stating that he (Gair) “had little experience in this direction,” and that Mitchell “is a very good sailor, and did most of the sailing.” He commended the “Roman candle” type rockets to be carried in lifeboats going forward.